Getting kids to brush their teeth for a full 2 minutes is NEVER easy. My kids brush for about 15 seconds and say IM DONE! I am super excited to share with you guys a way I have finally gotten my children to take the full 2 minutes. With a song! Tooth TunesTM ! 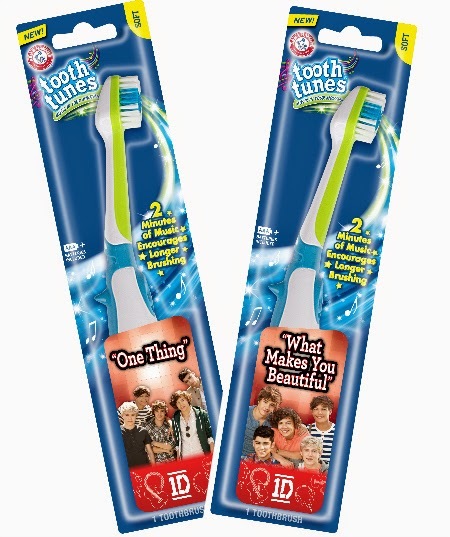 It’s the only toothbrush with Music In Your MouthTM technology. Just turn it on and start brushing to hear two minutes of your favorite music pumped directly through your teeth… straight to your head. And two minutes is the dentist-recommended time for brushing to help fight cavities and remove plaque. Which means Tooth TunesTM rocks in more ways than one! Tooth Tunes are set to play your child's favorite song for 2 minutes before automatically shutting off. With these, my kids have definitely been brushing for the full 2 minutes, they even dance along as they brush! You can purchase Tooth Tunes at most major retail stores for about $9.99.